The Alabama Digital Preservation Network (ADPNet) is a distributed digital preservation network for locally created digital content. It represents a low-cost digital preservation solution for academic institutions, state agencies, and cultural heritage organizations in Alabama. 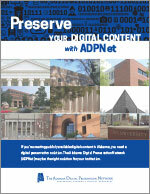 Any Alabama institution with digital collections that are freely available to the public is invited to join ADPNet and use the network for archival preservation. 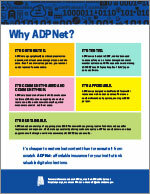 ADPNet is a Private LOCKSS Network (PLN). This means that the archived content is accessible only to the members and only if it is needed to restore content lost as the result of a mishap or natural disaster. ADPNet is a program of the Network of Alabama Academic Libraries. A steering committee with representatives from each ADPNet member institution sets policy and manages the network. In 2006, the Institute of Museum and Library Services (IMLS) awarded a two-year National Leadership Grant to the Network of Alabama Academic Libraries (NAAL) and seven Alabama institutions. With IMLS funding, these seven institutions established a low-cost distributed digital preservation network for the state of Alabama using open-source LOCKSS software. The project successfully demonstrated that a LOCKSS preservation network can support the digital preservation needs of different types of institutions. LOCKSS ("Lots of Copies Keep Stuff Safe"), based at Stanford University Libraries, is an international community initiative that provides libraries with digital preservation tools and support so that they can easily and inexpensively collect and preserve their own copies of digital content. LOCKSS provides libraries with the open-source software and support to preserve their digital assets. LOCKSS replicates the traditional model of libraries keeping physical copies of books, journals, etc. in their collections, making it possible for libraries to house copies of digital materials long-term. The LOCKSS community is committed to ensuring that libraries continue their important social memory role.